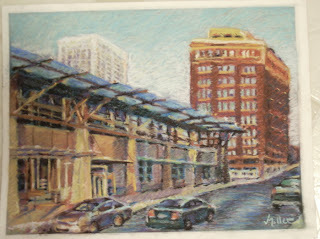 The Art of Vicki: New Pastel Cityscapes! My apologies for not posting more work on here! I've been all consumed with my research grant project this summer, and now working twords getting things together for my senior show this winter..... 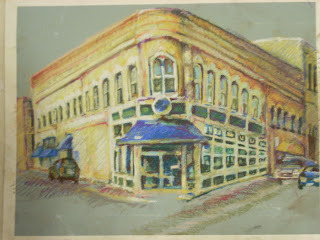 I thought it best to post a couple of new pastels I've completed so far, as part of my cityscape portion of my senior show..... One of them is the new public market in downtown milwaukee, and the other, the lovely coffee shop "the new moon" in Oshkosh. I will post new works as they come, and thank you dear ones for your patience and checking in on me and my work!